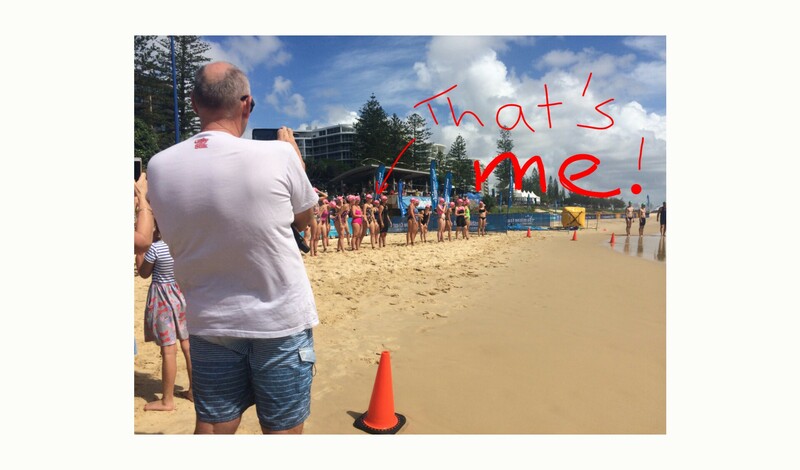 This coming Saturday, I am going to do a short 500 metre swimming race in the passage at Bribie (the same slice of ocean in which I did my first triathlon). And I’ve signed up for the next Grimsey’s Adult Swimfit, on Easter Sunday. Yep, I’m getting ‘back on the horse’ so to speak. And yep, I feel a bit apprehensive (deep down) which is why I knew I absolutely had to do these things. So, how to improve? I’ve been very lucky to have had so many nice comments left on the blog and on Instagram since Saturday – thank you. Your support has really helped me to approach the aftermath of my first DNF with positivity – which is driving me to try and understand how I could have been more prepared… and less close to drowning. Someone kindly contacted me and suggested that I need to try and ‘play’ in the water sometime, like I would have when I was little. My first reaction to this was ‘woah, there is no way I would have been getting in those waves when I was a little tyke!’ but actually that may not be true. Every year we used to have a family getaway with friends at a holiday village in the UK called Center Parcs – and basically the entire break would involve us kids spending as much time as possible in the pool. One of our favourite things was the wave machine, which we absolutely loved to get into. Every time the special ‘tarzan call’ came booming through the speakers to signal the waves were coming, we’d go running into the main pool to splash and play, duck and dive. So that’s one thing I will definitely do – a trip to somewhere with big waves (and a patrolled beach with lifeguards, don’t panic Mum) to practice just diving, surfacing, relaxing, learning not to fight the waves but to enjoy the experience. I know this has worked for me in the pool (trying to have a fun, positive, relaxed approach to swimming in the pool) so I do believe it would help in the ocean too. 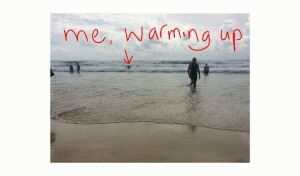 Although, I didn’t panic in the waves on Saturday. They just beat me. 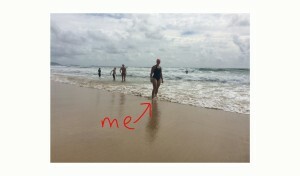 So I think I also need to learn more about swimming in waves – the tricks and tips to beating them. Not much help at all – because I did dive under the waves on the way out, and I got smashed repeatedly until I couldn’t take anymore. And although body-surfing sounded interesting, I searched through various sites to learn how to body surf back to shore on the waves, and they all suggested you’d need fins on your feet (the duck feet type things you see divers wearing) to body surf. So I gave up on Google for now and will see if either diving under waves or body-surfing over waves gets covered in one of my upcoming Grimsey’s clinics. The other thing is, I still have a lot of improvement to make with my swimming in general. More pool sessions, including perhaps some sessions where I try to swim underwater for as long as possible, will be helpful. If I get used to being underwater for longer periods that has got to be useful for getting dumped on by big waves. The pictures you’re seeing in this post were taken by my mum. I couldn’t look at them until today, and even when I did finally decide to open them up, I cried again. Looking over the pictures makes me think of that moment underneath the last wave before I decided to pull out. The bubbles, the seaweed, the dark, the fatigue. The sad realisation I had no choices left. 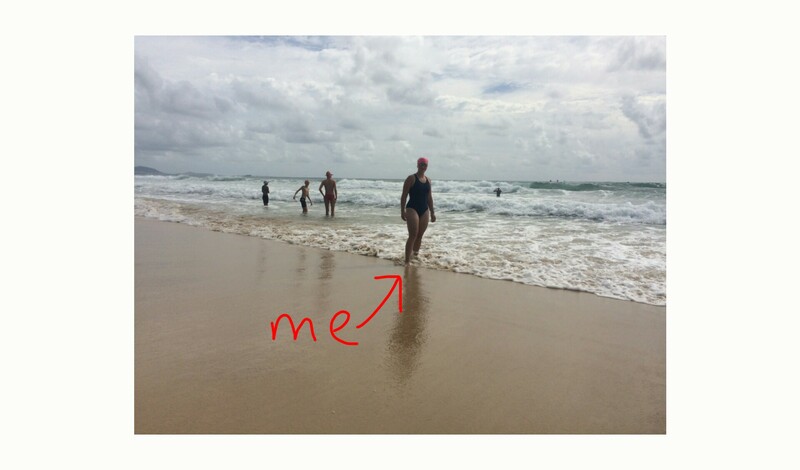 1) I should put my goggles on underneath my swimming cap, where the strap is more protected from waves (and other swimmers, for that matter). This could have made a big difference to my race, as I wouldn’t have lost my goggles on the way back in. 3) I should probably try to practice swimming without goggles, just to get a bit of confidence that it can indeed be done if I find myself in the same situation. 4) I need to take more time after a buoy (ie after a change of direction) to set myself on the most direct route back to shore. The law of maths say that if I get the angle wrong in the first few metres, this means a much bigger detour than getting the angle wrong in the last few metres. 5) Although I didn’t lose my swimming cap, I thought at one point I had. I’ve had to swim without a swimming cap in the pool once before and as I’m sure anyone with long hair can attest, it is almost impossible. Even though I had my hair in a plait under my cap, my fringe washed straight into my eyes and in my mouth. I have decided to grow out my fringe for the foreseeable future, just to give me the extra assurance that I can keep swimming if I do happen to lose my cap in future. For Grandpa’s sake if no one else’s, I should point out that I am absolutely OK. Not scarred for life or anything. I’m happy I had a go and I know it can’t get much worse than what happened on Saturday, so by the same token it can only get better. I’m feeling more and more sure that I’ll be signing up for the same Mooloolaba race next year, because there is a debt to settle, or a point to prove, or something. 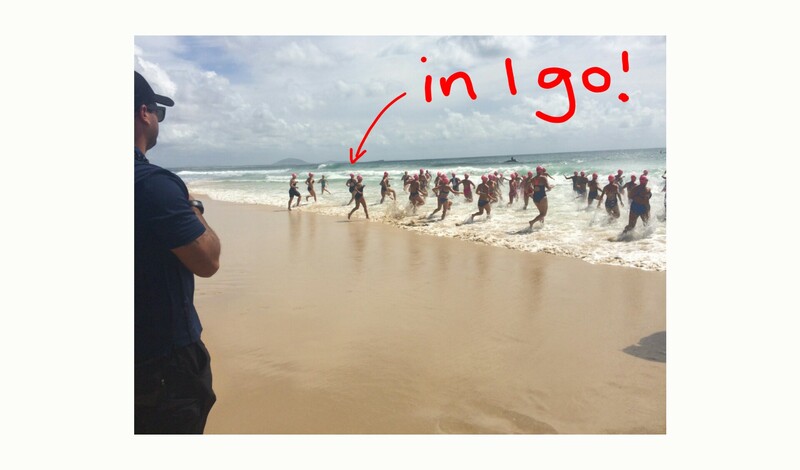 I’d already decided a month or so ago that I don’t think I’ll be doing the Mooloolaba triathlon in March 2017 (because there is another tri I’d like to do in March, if I survive the rest of this year) so giving the swim race another go shouldn’t interfere with any triathlon plans. Bugger it, I’ll put it out there now. I can’t sign up now because it’s not available yet. But I’ll be there; it’s a deal. She Can Try Again. 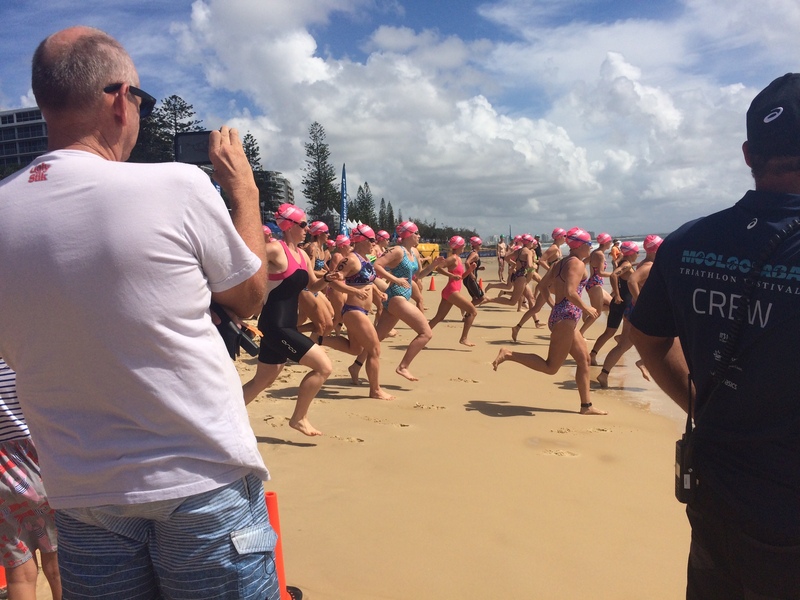 This entry was posted in Show Me Swim and tagged bribie, dying, failure, logic, newbie, noosa, straddie salute, strategy, swimming, training, triathlon. Bookmark the permalink.